Adventures in the Endless Pursuit of Entertainment: Happy Birthday, Angela Lansbury! This month, Angela Lansbury returns to Broadway for rehearsals of A Little Night Music, which is scheduled to begin previews on November 24th at the Walter Kerr. Last season, she starred in Blithe Spirit and picked up an historic fifth Tony Award for Best Supporting Actress in a Play (previously she had four for Leading Actress in Musical). Now, I love Murder, She Wrote, after all, it was the impetus that triggered my adoration of Angela when I was in high school (MSW just celebrated it's 25th anniversary!). But this is not her defining role at all, its just perhaps the one that gave her the most exposure to the world (hello, I saw it on BBC-1 when I was in London). At some point later, I discovered her body of film work - magnificent and diverse roles that established her as one of the greatest character actresses and garnered numerous Golden Globe awards as well as three Oscar nominations, beginning when she was just a teenager. However, it is her theatrical work that thrills me most. Her original cast albums - Anyone Can Whistle, Mame, Dear World, Prettybelle, Gypsy and Sweeney Todd , as well as original soundtracks Bedknobs and Broomsticks, Beauty and the Beast and Mrs. Santa Clause- are always in my rotation. She delivers with so much tenderness, humor and beauty, that I can see those brilliant performances in my mind's eye. Angela is arguably today's most beloved stage actress, as well as one of its best. Rooms hush when she walks in, crowds cheer, audiences go wild at just one note from her. 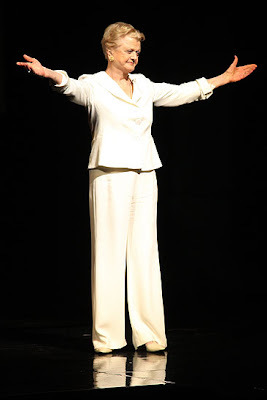 At a time when film and television roles are scarce for women even at age 60, audiences clamour to see this 84 year old. There is much to learn from her as well. Tall and beautiful, she is the picture of grace, class, agility and vibrance. She inspires good will as well as good health, patience, graciousness and a generosity of spirit. I am overjoyed to see her on the stage again in just over a month and will toast her return most gleefully. Happy 84th birthday to Angela! Happy Birthday, Miss Angela Lansbury! I know it isn't supposed to be polite to mention a lady's age, but you certainly don't seem your eighty-four years! You are lovely, and thank you for everything you have brought us! Have a wonderful day!